NOTE: New decal requirement for 2016/2017. If you are not an existing Team Member, you can signup here: http://mazdamotorsports.com/webapp/wcs/stores/servlet/B2BDirect/MazdaSportsHomePageArea/PreregistrationSubSection/PreReg.jsp?storeId=10001&catalogId=10001&langId=-1. Here is what I ordered for our car. I ordered white, they also have black and silver. 2ea @ MAZDA PATCH - 5"
2ea @ WHT MAZDA DECAL 16"
The stickers being provided in the NASA package are the minimum needed for the series. There are other contingencies you are eligible for that may have additional requirements, Mazda is one of those. 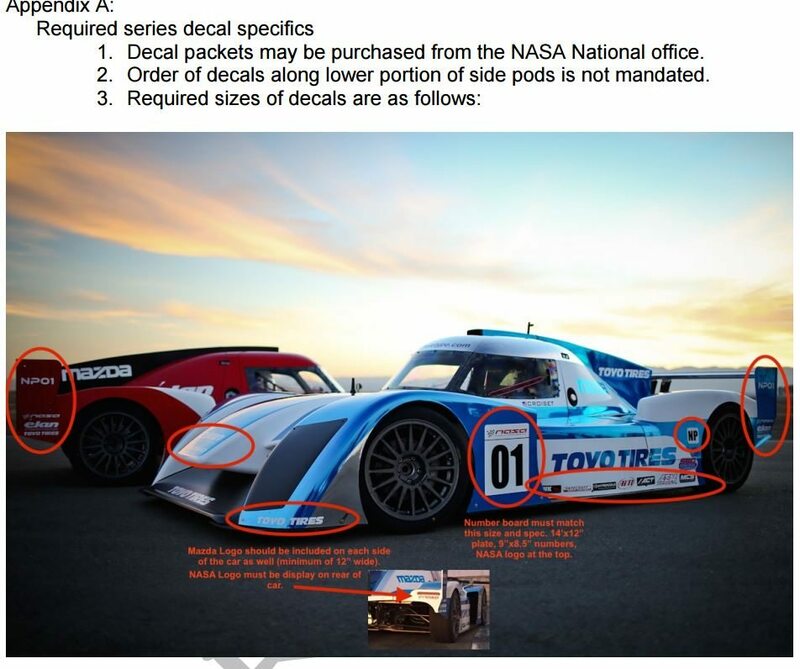 For all the different decals and placements, is there a "decal kit" if you will that will supply all these decals and placement positions on the car? To make life easier, the National Office is putting together packages that include all the sponsor stickers and patches, NASA stickers & patch, NP01 class identifiers and number boards. They have kits in white or black. We are still waiting for a few item to get on hand, but once the kits are ready, I'll let everyone know. Mazda says 16" on both sides of engine cover and one emblem/decal on nose. Which is the right way so we get paid money. That is a current question we have out to Mazda. And then for 2017 it said just the logo. I don't want to have to peal stuff off my new car. Since there are few of us now and the 2017 rules will be more in place why not just have us implement the 2017 now since these are all new cars. What they are asking is that it says "Mazda". There are a lot of SpecMiatas out there that say "MazdaSpeed". So we're golden with the package above. To answer the 16 vs 12 size, just order the 16" (they are $5 each) and you'll be 100% compliant. I don't think this change affects the NP01. Being it's a formula/sports racer, and those requirements are not changing. Can't see either nose properly but as i read the requirement a large mazda emblem with small mazda letter logo under it is the proper look. 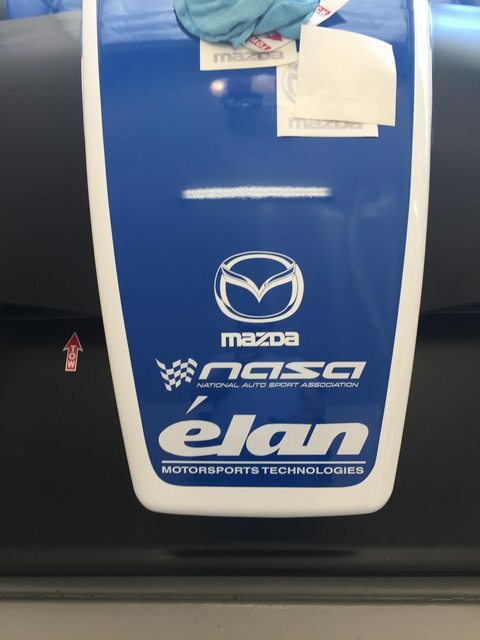 I put this one here on the nose (It hurt a little putting it on above Elan, but the Elan decal was already there).. I have the Mazda on the engine covers.